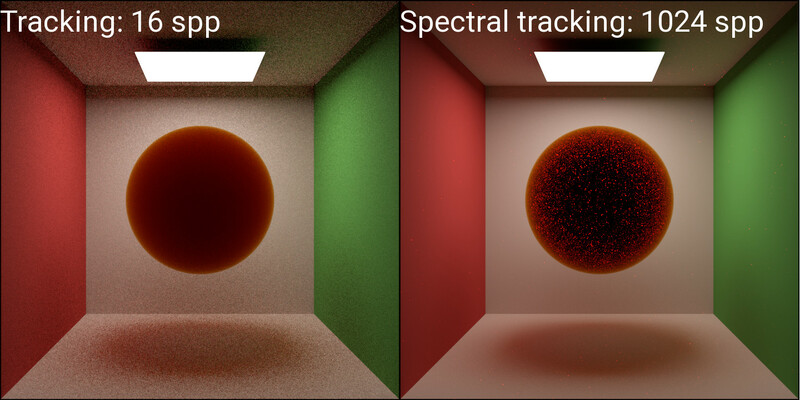 I'm trying to implement spectral tracking as described in Spectral and Decomposition Tracking for Rendering Heterogeneous Volumes. My implementation and the results can be viewed in this gist. Because my data is homogeneous I can compare against plain tracking, and find that the results match for cases where the absorption coefficient is not spectrally refined (apart from noise). In this case the spectral tracking weights simply are vec(1), so I guess it is the same algorithm as delta tracking. As soon as I introduce a spectrally refined absorption coefficient, however, I no longer understand what is going on. With the data I'm using, I basically only have to care about absorption, but even for that case I cannot figure out how I have to apply the weight to the computed transmittance. For normal delta tracking the transmittance is always zero when a collision happens, but for spectral tracking a compensation is necessary. Assuming the compensation weights are calculated correctly, something is wrong with the way I apply them. Any idea how I should apply the weights to the transmittance? mu_n = mu^bar - mu_t > 0 for some lambda if not all mu_t(lambda) are equal. somewhere around line 37 and 41, respectively. I think this is a very valuable hint! I did not get this part at all. The gist also contains updated images. Visual inspection seems to suggest that closed form tracking and delta tracking might converge to the same result now. But spectral tracking is incredibly noisy, at least for this absorption-only case. Do you think this looks reasonable? I'm still unsure about the scattering part. I don't really understand what your python code does in this case, but simply multiplying the estimated in-scattered light by the accumulated weight, like I do in the gist, doesn't seem to do the trick. Do you think this looks reasonable? Not sure. The method is pretty noisy, indeed. I actually wonder how you get your reference image so clear with jut 16 spp. Try the weighting scheme from "5.1.2 Incorporating Path History". It should reduce the noise somewhat. - t is updated before calling direct_light. But p still points to the previous interaction point. - You need to factor in the transmittance along the ray to the light source. Apart from that your code looks fine to me. Very much like my "spectral_tracking" function. I actually wonder how you get your reference image so clear with jut 16 spp. Excellent find! I introduced this error recently by shuffling around some things and did not even consider it anymore. After fixing this problem the results actually already look very promising. Isn't the transmittance along the ray handled by probabilities already? The delta tracking as described in the volume rendering course also doesn't need this. There you multiply the incoming light by the scattering albedo. But this doesn't seem to be necessary in spectral tracking because of the weights?! Spectrally refined absorption and scattering. The spectral tracking seems to converge to the same result as the ray marched reference. Closed-form tracking is slightly off. Do you think it is possible to modify closed-form tracking in such a way that it handles spectrally refined absorption/scattering for homogeneous media correctly? Or would you end up at spectral scattering anyway, because of the null collision thing we talked about earlier? Cool! And thanks for the link to the paper. Very interesting. Do you think it is possible to modify closed-form tracking in such a way that it handles spectrally refined absorption/scattering for homogeneous media correctly? For homogeneous media you have the analytic expression for the transmittance. So you have a lot of freedom with sampling strategies where you also have the pdf in closed form. I.e. you could make standard Monte-carlo estimators like transmission(x)*otherstuff(x)/pdf(x), x~pdf. Using a "mixture" pdf would be a possibility perhaps: pdf(x) = pr_1*sigma_1*exp(-sigma_1*x) + pr_2*sigma_2*exp(-sigma_2*x) + ..., where pr_i are the probabilities to select the i-th wavelength for sampling. IIRC this is a special case of MIS weighting. Not quite the usual delta tracking. But still. Instead of this pdf you could probably mix the modified pdfs that "force" samples to lie within a given distance. Good for very thin media. Isn't this implemented in PBRT? Hm, I quickly started implementing this for absorption only material and the results where even more noisy than spectral tracking (with history and no emission), which discourages me from going further in that direction. Instead of this pdf you could probably mix the modified pdfs that "force" samples to lie within a given distance. I think that is basically what closed-form tracking does. I guess it is possible to come up with a weight to fix the amount of inscattered light. But I suspect that the way in which scatter_distance is calculated has to be adjusted as well.